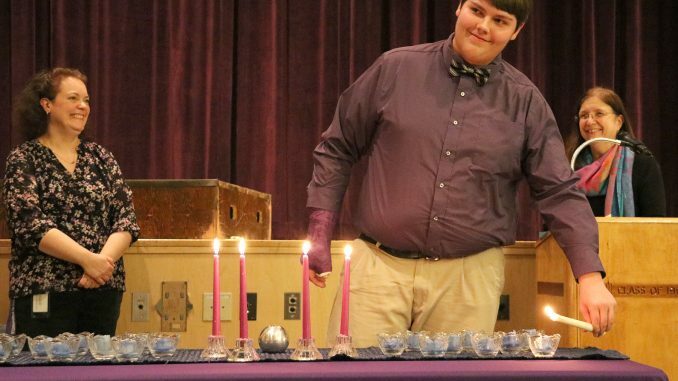 Senior Steven Baker lights a candle signifying his membership into the National Honor Society. 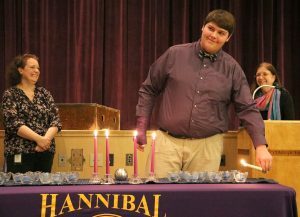 HANNIBAL – Eighteen Hannibal High School students recently joined elite company when they were inducted into the Sadie Adamy chapter of the National Honor Society. The new inductees were lauded for their scholarship, leadership, service, citizenship and character, as Principal Stephen Dunn offered words of encouragement. He noted that each inductee was well-rounded and exemplified the five pillars that are required for NHS membership. NHS co-advisers Carol Burch and Lisa Mason said the inductees exhibit good citizenship and participate in several volunteer service activities throughout the year. The 18 new inductees into the Hannibal chapter of the National Honor Society pose for a photo after the ceremony. They coordinate a Red Cross Blood drive three times a year, lend their time at the annual Christmas Bureau Carnival, deliver Christmas baskets to HCSD families, and each spearhead an individual service project. The new inductees are: Steven Baker, Krystina Carnifax, Christina Cole, Jillian Hall, Katherine McCraith and Makayla Zapanta (seniors); and Joseph Cerrillo IV, Kelsey Combes, Nathan Crego, Savanah France, Hannah Heald, Jacob Kelly, Noah Kuc, Ryan Nosko, Dillon Plantz, Zachary Shortslef, Erica Stauring and Bradley Wiggins (juniors).